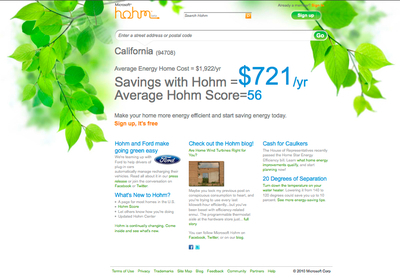 Microsoft™ built the Hohm site upon the HES data and modeling framework (rather than directly use the HES API). Hohm™ envisioned connecting data for electric vehicles, homes and utilities in one cohesive ecosystem to help consumers understand and manage their household energy consumption as well as help utilities manage the growing demands on the energy grid. The Hohm site design allowed it to accommodate and scale to the increasing number of devices, vehicles, and data connections that consumers and providers utilize in the energy ecosystem.